I did mean to mention - none of the fibres I'm dyeing are being put up anywhere formally for sale until after Wonderwool. But if anyone's reading this and feels their life won't be complete until they have some in their hot sweaty little mitts NOW, please do drop me a line and I'll either pop it on Etsy for you or sell direct. Always eager to please, me. This is the second pair of Greenleaf Wristwarmers, which I finished last night. Mark actually managed to get the camera to focus! I'm really pleased with these, and will surely make more - I managed to load the .pdf properly on Ravelry this morning, and am very flattered by the amount of people who've favourited and queued it! This has been on the needles since Friday evening - I cast it on on the train to Bradford and knitted a good two-thirds of it so far during Terry Jones' screen talk and 'Erik the Viking' at the Media Museum. It's one I've done several times before and given as presents - as it's been well received, I'll write up a pattern this week. Good basic cinema knitting. (Zagged Garter scarf). And the above reminded me of this - this lives over my chair at work, and is the first example of my Very Basic Garter Stitch Shawl. It's so basic that any pattern would be more of a recipe than a formal pattern as such, but it's a good base to embellish with interesting edges. I churned out a few more greens towards the end of Sunday's session. This is a much brighter green than Mirkwood, called Beryl. The top is on the superfine merino, the bottom on BFL. This is Redleaf on BFL. I think more reds will be in the pots this afternoon. And oranges and golds. But not too many - purples, blues and greens sell better. And must remember to do sludgey colours too - like Baranduin and Dorlomin. My basic blue this year, Sailor, on the superfine. This would make an utterly gorgeous lace something or other, spun into fine yarn, with it being shades of similar colour. I did mention I'd done some bright stuff, didn't I? Festival on superfine. Demeter. One of my favourites from last year, slightly tweaked because I have different orange dyes. Another one of the colourways that's much, much better on the coloured BFL than white fibre. I was intending to go on another fibre acquisition hunt up to Adelaide's yesterday afternoon, with Eleanor, but they were shut. We're off on Wednesday instead. Need more BFL, and I'll get some Teeswater, and probably some Cheviot, which makes fabulous bouncy yarn (and is perfect for socks). North Country sheep - what could be better? ... not long til Wonderwool. Much dyeing has been done. This is what the creel looked like on Friday evening, with most of last week's dyeing piled up. This has all been packaged up and bagged, and more is on its way. My 10 kilo bump of 16-micron Australian merino arrived on Friday evening, and it's wonderful. This is what it looks like dyed with Murex. I've got to be careful with it, because it will felt extremely easily. And this is the Bluefaced Leicester, which has muted the brightness somewhat. Not completely happy with it. I really don't like this, and have no idea why I've wasted 400g of the BFL with it. It worked brilliantly on the much darker 'black' BFL last year, but this paler coloured fibre isn't working. I'll package up anyway, but will probably end up overdyeing at the end of the season. Beech on the superfine - I love this. It's brighter in real life, and really is the colour of new leaves coming through. There are several more colours, including the extra bright Festival and some more camel/silk, but the dark had come down on me yesterday evening before it was dry and 'pouffed' enough to photograph, and of course it wasn't properly light this morning when I left, because of the stupid BST. 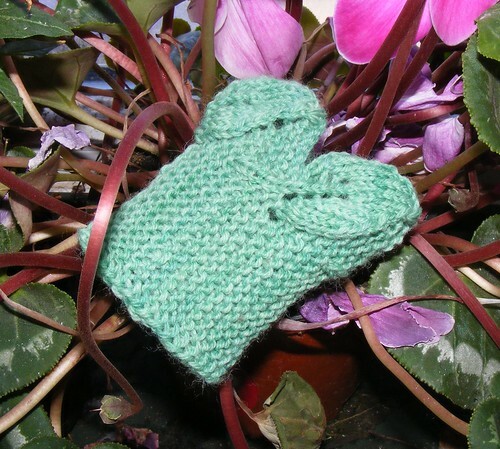 I have loaded a new pattern on to Ravelry - Greenleaf Wristwarmers. I'm partaking in a swap on the Folklore list, and while I was thinking about the edging on the Mallorn Shawl (end in sight, if I remain happy with the edging so far) I found something to play with in Barbara Walker 2. I've done one and a half pairs of these so far, and I can see more in my future. I wonder how many uses of this pattern I can find? ... my photo card and until I get another one (bought this am on eBay) there will be no photos. Not a happy bunny - I think it must been pulled out of my bag yesterday afternoon as I was going home. I'd kept it in the same pocket as my metrocard, which with hindsight was not a good idea. I finished off the Corriedale fleece last night, with purpley-blues, greens and hot orangey-gold, then did 400g of coloured BFL in Northern Lights. I shall have to do some packaging to clear some drying space. I did pop a couple of pots on yesterday afternoon, more of that Corriedale fleece. This is now about half of it (it was a big fleece; it was sold in four separate bags on two separate stalls at Wonderwool last year, and I had to track it down) and the rest's soaking. On the minus side, when I came home from work Lunil was looking guilty at the top of the stairs. In the sitting room there was dead, in pieces all over the floor, two small balls of wool and the entire 100g of Hyacinth BFL I was saving for me. The vile Tid had removed them from the bag they were concealed in and obviously tempted Lunil. I was not happy. And now have to think again (and dye again) for my Ravelry Folklore swap. I bought a fleece at last year's Wonderwool that, apart from being washed and a small sample spun, hasn't been touched. It's a Corriedale ewe's fleece, in creams and beiges and pale browns. Some got stuffed in the dyepots last night - some with greens and golds and some with reds and blues. More alpaca - this time in Plum. And this lot's in Sailor, which I'm really pleased with - I love the ever-so-slightly greenish tint to this blue blend which tips it over in the the maritime. I took the photos this morning, about 6am in front of the window - the sun wasn't up because we're too low down in the valley, but there was strong light coming through and combined with the flash I got a pretty accurate rendition of the Flora alpaca. And again, I rephotographed the Mirkwood - this is a much better likeness. I have now run out of the bouncy, shorter-stapled fine wool that most of the last week or so's dyeing has consisted of. I rang the chap I buy bulk fibre from last night; he has some bumps of a 19-micron merino in and is sending me a sample. If this is as nice as it sounds, I shall have to invest. In the meantime, I have a pile of superwash merino to weigh out and start dyeing, and the 2 kilos of coloured BFL I got from Adelaide Walker's last week. I may not dye this afternoon, as I have an appointment with some needles and have no idea how sorry for myself I shall be feeling afterwards. And, as ever, the pupz need a big chunk of my afternoon for their constitutional - at least the lovely springlike weather means pupz remain dry and unmuddy and fibre dries quickly. Guild on Saturday, so as it was a 'bring stuff to sell' day I thought I'd trawl all my fibre out for its last outing before Wonderwool. I wasn't really expecting to sell anything, so was very pleasantly surprised to take nearly £100 home. This will be reinvested at Adelaide Walker's in the next week or so. Sunday was spent toiling over bubbling dyepots again (after we'd been out for lunch at Salts Mill and I'd dutifully turned up at Ma's with flowers, a card, and my primrose photograph framed up). When I was up at Adelaide WAlker's last week (my second visit of the week!) I noticed he had some Teeswater tops. Now Wensleydale used to be ubiquitous in the hand-dyed tops market, but seems to have disappeared - it felts soon as look at, and I think people got wise to this. But Ian gave me a length of Teeswater to try, and I'm really pleased - it fluffed up on drying and has retained its luster and silkiness. And a named breed always adds to the appeal. He has some Cheviot too, which makes fabulous hard-wearing yarn and takes dye well, so I think some of that will be called for. This length was shoved into the Beech pot. This is the interesting result of changing my red and orange dyes. The Brick follows the recipe for last year's Birch, but obviously the new orange is much more dominant than the previous. So I shifted everything along a bit and created Beech. Colours aren't completely correct as I wasn't outside - these were all taken on the creel as they dried yesterday afternoon and evening. The entire flat is smelling like a wet sheep liberally sprinkled with vinegar, and will continue to do so until the end of June and past Woolfest. Mulberry. Perhaps a little bluer in real life. I wanted a good reddish-purple and I'm pretty pleased with this one. pretty. I wanted a dark, murky, foresty green, but ended up with something a bit lighter. Mirkwood. I was aiming for an aquatic sea-blue/green - I might take it a bit greener next time, or darker. Triton. Not a good photograph for colour here - I took it at 6ish this morning and there was no natural daylight to speak of. It's alpaca dyed in Flora which has a better reproduction below. But the sheen from the fibre's lovely, and it's fluffing beautifully on drying. This is the 'Mallorn' project that's rapidly heading towards the end. It's specifically designed for knitting on while watching television or reading - every other row is plain purl. I'm currently thinking about the edging treatment, and I think I know what I'm going to do. The yarn is lovely even if I say so myself - it was a silk and merino blend from P&M at Woolfest in 2007, spun from the fold in small chunks to keep the colours as short as possible. It'll block out very nicely. All dyeing, knitting and fibre-stuff is now moving over here.